Pecora provides a full range of innovative architectural and weatherproofing products along with a proven history of technical expertise. Pecora protects and enhances every aspect of your new construction project from weatherproofing the exterior to providing interior sealants that include acoustical, fire-rated and anti-microbial options. To meet the challenge of these criteria, Pecora has worked to become the leader in the industry by providing value added products that have become standards in sealant and weatherproofing solutions. NST Non-Staining Technology ™ – the industry’s first complete non-staining silicone program. 864NST, 890NST, 895NST and 898NST eliminate the possibility of damage to valuable porous substrates by fluid migration. 864NST – the industry’s first Non-Staining, Low Modulus silicone designed for Expansion and Control Joints. 890NST – the legendary Non-Staining, Ultral Low Modulus silicone. 895NST – the industry’s first Non-Staining, Medium Modulus silicone designed for Structural and Non-Structural Glazing. 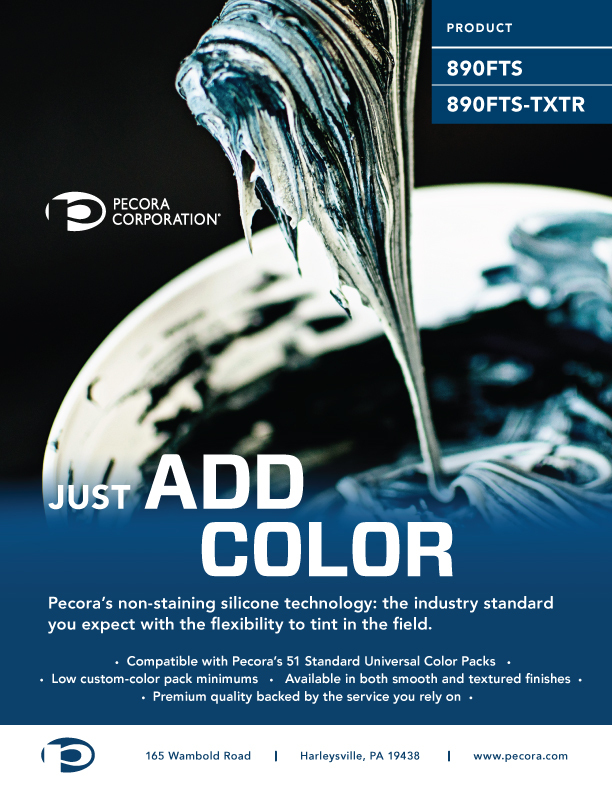 Unprecedented Flexibility with 890FTS and 890FTS-TXTR – high-quality, non-staining silicones that can be quickly and easily tinted on the jobsite and is the industry’s first field tintable silicone to offer a textural option. Standards in Urethane – Ensure the durability, adhesion and abrasion resistance required between materials of similar or dissimilar surface textures, porosities or expansion coefficients. These high-quality products provide paintability, high tear resistance, low shrinkange and a variety of color options. AC-20® +Silicone – this high quality siliconized acrylic caulk provides exceptional adhesion, is easy to tool, readily accepts paint and provides easy clean-up with water. AC-20®FTR – UL® certified in firestopping systems for expansion joints and through penetrations. AIS – 919 – aids in the reduction of sound transmission through partition systems.